A commercial Dragon cargo craft launched June 29 departed the International Space Station and returned to Earth on Friday with nearly two tons of cargo and research samples. Operating under commands from mission control, the station’s Canadian-built robotic arm detached the Dragon capsule from a berthing port on the Harmony module, then released the automated supply ship at 12:38 p.m. EDT (1638 GMT) Friday. A series of thruster firings propelled the Dragon capsule away from the space station, and the ship’s Draco thrusters ignited at 5:23 p.m. EDT (2123 GMT) for a de-orbit burn. After the braking maneuver, the Dragon’s disposable trunk section jettisoned to burn up in Earth’s atmosphere, while the craft’s pressurized cabin plunged back to Earth for a searing-hot re-entry protected by an ablative carbon heat shield. Flying on a southwest-to-northeast track, the capsule deployed drogue chutes, then unfurled three main parachutes before splashdown in the Pacific Ocean, which was expected to occur around 6:17 p.m. EDT (2217 GMT) in the Pacific Ocean southwest of Los Angeles. 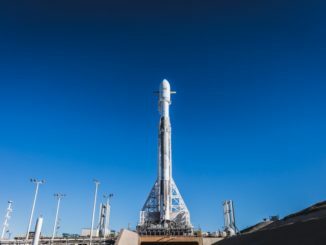 SpaceX later confirmed a successful splashdown, concluding the company’s 15th resupply mission to the space station under the space transport company’s more than $3 billion, 20-launch cargo contract with NASA. 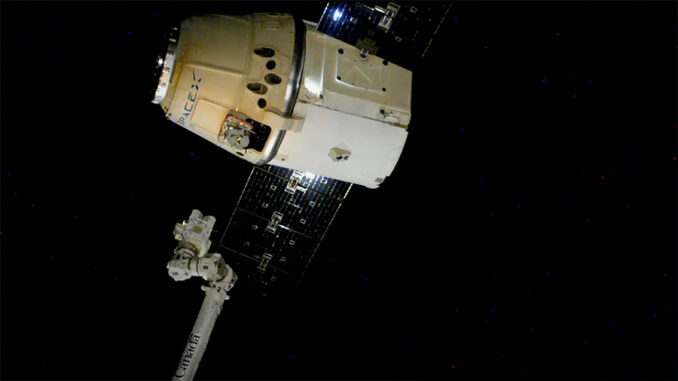 It was the fourth round-trip cargo flight with a reused Dragon capsule. A SpaceX recovery team was on standby in the Pacific Ocean to ferry the capsule back to the Port of Los Angeles over the weekend. NASA said the spacecraft returned to Earth with more than 3,800 pounds (more than 1,700 kilograms) of cargo, including specimens from biological experiments conducted on-board the space station. 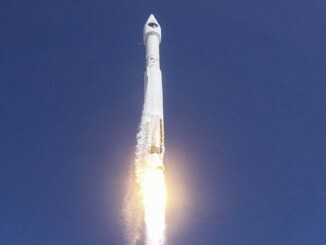 The unpiloted supply ship launched from Cape Canaveral on June 29 aboard a Falcon 9 rocket, and it reached the space station July 2. The same Dragon capsule first flew on a previous cargo mission to the station in July and August of 2016. The mission which ended Friday delivered 5,946 pounds (2,697 kilograms) of equipment, experiments and provisions to the orbiting research laboratory, including an AI-powered helper bot for the research lab’s six-person crew, a spare hand for the Canadian robotic arm, and an externally-mounted NASA instrument to monitor the health of plants on Earth. The Dragon’s trunk section, which burned up during re-entry, also disposed of a defunct science instrument developed by the Naval Research Laboratory that studied the upper atmosphere’s structure, density and temperature after launching in 2009.